Success isn’t an overnight phenomenon when it comes to SEO, but with the right process and a dose of patience, it’s always within reach — even if you’re running your own blog. Optimizing your blog posts begins as early as the inception of your idea, and from then on you’ll want to consider your keyword targeting, on-page factors, your intended audience, and more. In today’s Whiteboard Friday, Rand spells out a step-by-step process you can adopt to help increase search traffic to your blog over time. Howdy, Moz fans, and welcome to another edition of Whiteboard Friday. This week we’re going to chat about blog post SEO, specifically how to nail the on-page optimization process, the thought process, the strategy process, the content creation and optimization for a blog post. So if you are writing a blog, there are a bunch of things that you need to do to be great at SEO, and there are some steps that I think you can follow. This is not one of those things where I’m going to say, “Oh, you absolutely have to follow this from end to end for every post that you write, and it’s a big, formal, complex process.” A lot of this can be done in your head before you start writing the post, before you start creating it. That’s totally okay. This does not have to add a ton of layers of involvement. 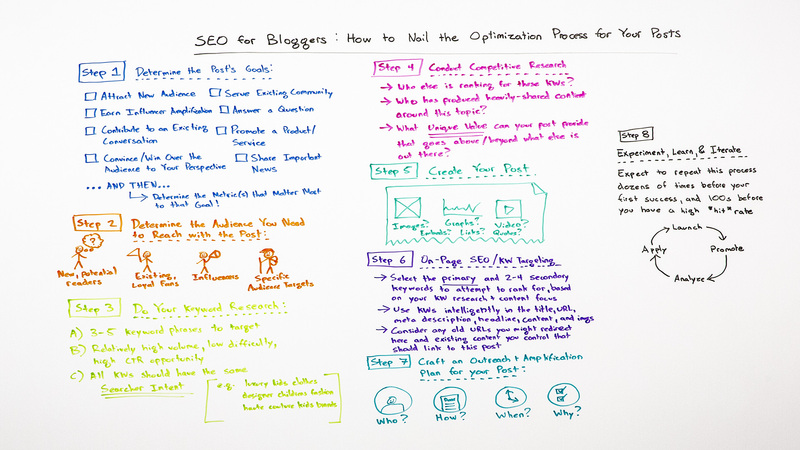 But if you use this process as you’re creating each post, which I do many, many times for Whiteboard Friday, this blog post that you’re reading and watching right now, and for all the posts that I write, it can be hugely helpful and eventually transformative in your ability to get search traffic to your blog. Attract a new audience in this particular sphere. Convince and win over people to my perspective on a particular topic. I’m really trying to promote a product or service with this post. Share some important news about my organization or my company. Share something that’s happening in my sphere. Contributing to a conversation that already exists out in the blogosphere or the social media world or the news world in your space. Answer a question or earn influencer amplification. Whatever it is, make sure you know what it is before you go into the post. I hate to see folks starting with step three, like doing keyword research when they have no idea what the post goals are. One thing before we skip to step two is once you know what you’re trying to do here, determine the metric or metrics that matter the most to that goal. So for example, a metric could be visits, just raw traffic. It could be engagement on the post. It could be comments. It could be links. It could be social shares, because you’re trying to reach a new audience that’s on LinkedIn. You haven’t done very well on LinkedIn in the past, but you think this post is perfectly targeted to that. Or you’re only really trying to get one or two people’s attention, particular influencers, in which case your metric might be: Did they come and read it? Did they share it? If the answer to that is yes, you’ve accomplished the post’s goals. But you need that metric recorded. Related, determine the audience you’re trying to reach with the post. So that could be potential new readers. It could be existing loyal fans. “Yay,” he’s waving a flag. It could be influencers, folks who have the ability to broadcast your message, and maybe you’re not even trying to attract them to broadcast this particular message, you just want their attention so in the future you can reach them. Or it might be very specific audience targets, in this case my backpacker readers. Moz does that all the time. For example, I might do a Whiteboard Friday that is specifically for e-commerce websites or specifically for B2B folks. I’m focusing on a particular audience target with that content. Now we’re going to do our keyword research, because we know what we’re trying to accomplish and who we’re trying to reach. So we’re going to try and find three to five keyword phrases to target. Why three to five? Because generally, that’s what you can reasonably expect to be able to reach with a single blog post. I’ll talk a little bit more about on-page optimization in a sec. I’m looking for, as we’ve talked about in our keyword research-focused Whiteboard Friday just a few weeks ago, which you should check out if you haven’t already, we want relatively high volume, low difficulty, high click-through rate opportunity. Meaning, there is a good number of people who search for it, it’s not that hard to potentially rank for, and there are not too many other features in the search result that are going to take away from my potential ability to rank with web content. If there are, by the way, lots of people who have images or lots of people who have videos in this search result or lots of news content, then you want to think about, “How do I get my post to include those?” I might think about, “Hey, maybe this post should be very visually centric, or maybe this post should be a video.” “Or maybe this post should try and get into Google News.” “Can I get my blog into Google News?” If I can’t, maybe I want to find someone whose platform I can publish on to get into Google News. All the keywords that you target should have the same searcher intent. What do I mean by searcher intent? I mean that the people who search for those three to five terms and phrases are all trying to accomplish the same goal or very, very similar goals. So an example might be, if someone is searching for “luxury kids clothes,” that is likely very, very similar to someone searching for “designer children’s fashion,” or “haute couture kids brands.” They all have the same intent. They are thinking about purchasing, or investigating at least what brands in the fashion space offer children’s clothing, and they’re all in the luxury, high-end, haute couture, high-priced space. Perfect. These are all matching that searcher intent. “Who else is ranking for this keyword?” I can just go to Google, take a look at that, or I could look at the SERPs analysis through something like Keyword Explorer. “What is it that’s the unique value that I can bring to the table with my blog post?” Unique value meaning not just unique content. Obviously, what you write is going to be different than what other people have written or created. But how are you providing value that is different from what other people have provided? Is that because your opinions are very unique? Is it because you are providing a better experience? Is it because you’re providing that content in a different format? Is it because you have access to unique researcher data? Whatever those things are, you need to answer that question because we’re trying to go above and beyond what else is out there. I’m going to go ahead and create the post, and this is where a lot of that research comes into play. Because I know what my post goals are and who I’m targeting, and some of the keyword research and what people are looking for around this topic, as well as what’s already out there, I can now make a post that is unique and uniquely valuable. This is huge, because it means that my post has much greater potential to reach its audience and to perform well, and to be perceived by both searchers and search engines, as well as sharers and influencers and folks on social media, as much more worthwhile. I also want to think about, in here, the types of content that I want. So written content is pretty obvious for most blog posts. But I should also think about things like images and graphs or data, video. Do I want to embed content from other places, maybe SlideShare, or I want to embed some rich media file? Or maybe I want to link to other places out there. Maybe some people have produced content on this and I would like to get their attention, and I would like to reference their work, and so I’m going to link over to them. Maybe I want to embed some quotes or get some quotes from some notable folks about the particular topic or get other opinions for the piece. All of that type of stuff I should think about as I create the post. This is the on-page SEO portion. So I’m going to take those three to five terms, and I’m going to think about one of those as the primary keyword phrase that I’m targeting. That’s going to be the one that goes exactly matched in the title and the headline and the URL. I’m also going to think about two to four secondary keywords that I want to attempt to wrap into potentially the meta description and image alt tags and the content itself. I’m going to try and use these keywords intelligently in places like title, URL, meta description, headline, content, images, all those spots. Then I want to consider any old URLs that I might redirect here. So let’s say that perhaps I have done a blog post on this topic in the past six months ago or two years ago. Do I want to redirect that old post to this one? Or are there posts that I should go out there and find, or content anywhere on my site or on any site that I control or influence, where I want to link to this content, this new post that I’m writing now that I’ve created it? This can be helpful for discovery. It can also be helpful for internal linking, helpful to your audience who’s reading your old stuff, and helpful to search engines to find, index, and hopefully rank your new content. Who do I want to reach? Who do I think will help me amplify this? How am I going to target them? How am I going to reach out to them? Is it going to be via email? Is it going to be via Twitter? Am I going to see them in person? Do I have a direct relationship? Do I need an introduction? Do I want to comment on something that they have done, whatever that might be? When should I do that? Do I want to do it beforehand, because I’m trying to get them to look at the content or contribute something to it prior? Or do I want to do it after I’ve published it and promoted it, and why? Meaning, why is this person going to help me? What does it do for them or for their audience? Does it make them look good? Is it something that in the past they have shared lots of things like this, but this one is uniquely valuable or better, or provides new information that they didn’t have before? You need an answer to all of those questions when you create that plan. I’m going to experiment, I’m going to learn, and I’m going to iterate on this. So look, in this process, some of these things, for a big, big post you might spend a lot of time on each of these steps very thoroughly. For a post that’s sort of a toss-away, quick opinion, I’m trying to write it in an hour or less and get it published, maybe I’m just thinking about these things in my head and doing real fast keyword research and targeting, and the rest of it’s sort of just a mental model that I have. But regardless of that, I’m going to expect that this process is going to be repeated dozens of times, 30, 40, 50, 70 times even, before I should expect my first success, especially if you’re a new blog or new blogger, and that I’m going to have to do it hundreds of times before I’ll have a relatively high hit or a high success rate, where lots of your posts are doing well and earning you rankings and ongoing traffic and social shares. This is not something where you follow this process and you have instant results with your first post. That’s not the case. No one has that in blogging. That’s just not how it works. 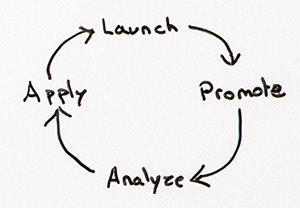 You’re going to launch, promote, analyze, apply the information that you learn, and launch again. This process is going to happen over and over, and the more you learn and apply, the better you’re going to get at this system. All right, everyone. Hope you’ve enjoyed this edition of Whiteboard Friday, and we will see you again next week. Take care.